Asylum seekers and their children have spent years living in an institutional setting that was designed as a short-term solution. They are accommodated by the State in residential institutions, under a reception system known as Direct Provision. Direct Provision is intended to provide for the welfare of asylum seekers and their families as they await decisions on their asylum application. It ‘directly provides’ essential services, medical care, accommodation, and board with three meals a day provided at set times. When the the system was established in 2000, it was described as an interim solution to the high numbers of asylum seekers entering the State in search of protection, and the growing concerns about the risk of homelessness for that population. More than 15 years later, little has changed in the physical conditions, supports, or treatment of asylum seekers while they remain in these centres. There are two Direct Provision centres in Galway – Eglinton Hotel and the Great Western off Eyre Square – where asylum seekers are living as they await their applications to be processed. Zimbabwean woman Blessing Moyo has been living in Eglinton House, a former Salthill hotel, for the last eight years where she had never been allowed to cook a meal for her three children. Blessing said the ban on cooking was adding to the sense of dislocation. “We are raising a generation of people who feel like they don’t belong anywhere,” she said. She also noted that there was no multicultural restaurant in Galway where people from all over the world can walk in, sit down together, have a meal, and a chance to get to know each other. This led to the creation of One World Tapestry a not-for-profit, pay-as-you-feel, venture that aims to create a space for people to come together through food and experience an inclusive community, while working with asylum seekers to help them use their own skills through volunteering. 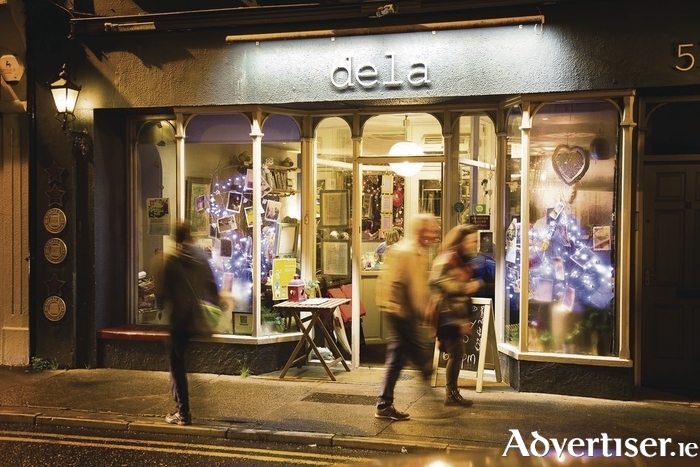 In November last year, an event in Dela on Dominick Street, Galway, saw close to 100 people get together to eat, socialise, and enjoy an inclusive evening. Hosted by Blessing Moyo, along with chef Alan Gosker and Dela restaurant owner Margaret Bohan, there were no set prices for the food which was inspired by global cuisine. Guests were invited to pay what they felt was appropriate, not just for the meal but also for the experience and future possibilities. Now it is time for One World Tapestry part two, the pop-up is celebrating the five continents, this time with support from local restaurants such as Kai Cafe + Restaurant and all things New Zealand, Aroma Foods infusing Indian cuisine and culture into the evening, and Da Roberta's bringing a taste of Italy, while of course Blessing will be showcasing the unique flavours of Africa. All are giving their time and skills to unite these communities and food cultures together. Two hundred people are expected to be served on the night, so that a significant sum can be raised for Blessing and her work on the campaign for the rights of people in Direct Provision. Customers can expect African dishes inspired by oxtail and beef, Kai will be bringing a fusion of New Zealand's best loved dishes. Italian influence will be vegetarian and pasta based. There will be Kafta curries and lamb biryani, a special Dela dessert, and live music too. Chef Alan Gosker says: “We are doing dishes from five different continents and enlisting the help of other restaurants and food producers in Galway. We want to highlight the issues surrounding asylum seekers in Direct Provision centres across Ireland and promote positive inclusiveness and sharing of cultures in our communities. We are also opening an hour earlier at 5pm to hopefully accommodate the people who last time could not get a seat. Drop on down and help us make this night a success so that we may build upon the last event and look forward to future get togethers." Chef Jess Murphy from Kai had spoken to a boy who just wanted his mother to be able to cook pancakes for him on Pancake Tuesday, like all his Irish friends could. “There needs to be a way to change that. We’re happy to help,” she said. The ultimate goal is to find a permanent home that will embrace all cultures and religions. Asylum seekers are denied the basic right to cook for their families, to work, and to attend third level education. The aim is to highlight the multitude of physical and mental problems this afflicts upon Direct Provision residents by giving them a chance to cook their food and to have people from every walk of life experience an environment safe from fear and hatred. The Direct Provision system was supposed to be a temporary accommodation but many are waiting eight or 10 years, during which time they cannot fend for themselves, because they are not allowed. They do not know when they will have the freedom to do the simple, ordinary, things of life like cook a meal or get a family pet. People in prison have a date to hang their hopes on — people in Direct Provision do not. The One World Tapestry pop-up will begin at 5pm on Monday March 13 at Dela Restaurant on Dominick Street. For more information check out Dela Restaurant or One World Tapestry on all social media channels or phone 091 449252.